Having your child go missing is, I'm guessing, one of the scariest things that could ever happen to a parent. The uncertainty of knowing where your child is, the knowledge that you can't help them. But what about everything else that happens to you when your child goes missing? In Gilly Macmillan's Burnt Paper Sky we meet Rachel Jenner, whose eight-year-old son Ben disappeared when she let him run ahead of her in the woods, and James Clemo, the detective put in charge of finding Ben. Macmillan has obviously taken inspiration from various cases of missing children that have hit the headlines in recent years, but in Burnt Paper Sky she takes us into the world of the parents, beyond those headlines. We join Rachel a year after Ben's disappearance, as she recounts what happened - not just her feelings and fears over the disappearance and what was happening to Ben, but her paranoia, the way other people looked at her, the way the media was on her side and then wasn't, the way one simple, gut reaction resulted in everyone seeing Rachel as a completely different person. Macmillan examines the psyche of a woman who is facing judgement from all sides when all she wants is for her son to be found, and the psyche of people like us - members of the public, the media - who watch from the sidelines when something like this happens. And judge. And form opinions about something we really have no idea about. Rachel is an interesting character - she's not quite an unreliable narrator, but her stories are always tainted by her emotions, so they're completely reliable either. Not only is Rachel dealing with her fear for her son, she is also compromised by her feelings for her husband and his new wife, and for her jealousy over her sister's perfect life. It's almost a toxic mix, and one that means the reader is never quite sure whether to be on Rachel's side or not. That conflict the reader feels is made manifest in the novel through the character of James 'Jim' Clemo. His narrative is a little different to Rachel's, instead of hearing from him directly in the present, we instead read transcripts of his conversations with a psychologist, and then revisit the case in the past. Jim is clearly still suffering as a direct result of the case of Ben Finch; he's having panic attacks and trouble sleeping. As well as Jim and Rachel, Macmillan also introduces a bunch of other characters, including anonymous social media users, who illustrate the conflict between a police investigation and a trial by the public, and the difficulty of everyone now being able to seemingly find out everything at the click of a button - everything but where Ben is and what has actually happened to him. The internet makes everyone an expert, and Macmillan illustrates how that's definitely not a good thing. One place where Burnt Paper Sky falls down slightly for me is the fact that there is almost too much going on at times. In addition to the stories of Rachel and Jim, I can count four other characters who have a lot going on, and two of those have dark, mysterious back stories that sort of come to have a bearing on the case when they really didn't need to. 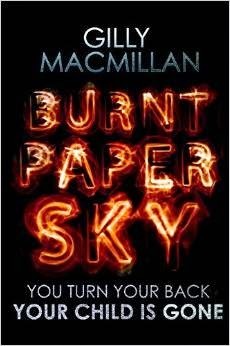 I get that Macmillan is trying to illustrate that everyone has secrets, but I don't think that everyone in Burnt Paper Sky did need to have secrets - Jim and Rachel are strong enough to carry the book, and not everyone needs a horrid life story to take horrid actions - sometimes people are just mean. Ultimately, Burnt Paper Sky is a mystery novel, so what happened to Ben Finch? Where did he go? Who took him? Is he alive? Macmillan is good at keeping those questions at the forefront of our mind of our mind all the time, and also at never letting us be sure what happened. I realised approximately a page before Rachel realised what had happened, but up until that point I had no clue, thanks to Macmillan's clever writing. Burnt Paper Sky is a gripping, suspenseful novel, and one that is a different take on the missing child plot. It'll keep you guessing, and also make you place yourself in the minds of the characters, and experience their fear and uncertainty and self-doubt. You'll never be sure who you believe, or whose side you're on, but you do know that you want to find Ben Finch. How I got this novel: From the publisher, Piatkus. This did not affect my review.